The Men's Health Forum has welcomed a report from the All Party Parliamentary Group on Cancer which highlights men's high mortality rates. 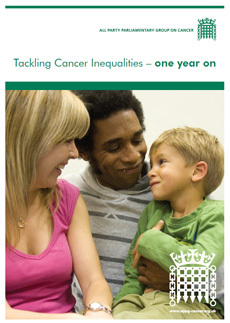 The All Party Parliamentary Group on Cancer launched Cancer Inequalities – one year on at its Britain Against Cancer conference. The cross party committee of MPs and Peers says there is still work to do in order to understand why men's mortality rates are higher than women's and that needs to include looking at early diagnosis and general lifestyle. However, it reports that the National Cancer Equality Initiative has found it difficult to secure funding for this work. The Forum has been working on a Department of Health backed project looking at how to get more men to take part in the NHS bowel cancer screening project. A conference on this issue takes place on 26 January 2011.